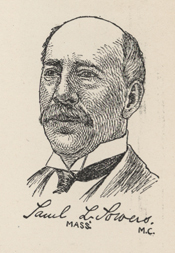 POWERS, Samuel Leland, a Representative from Massachusetts; born in Cornish, N.H., October 26, 1848; prepared for college at Kimball Union Academy, Meriden, N.H., and was graduated from Dartmouth College, Hanover, N.H., in 1874; studied law in the law school of the University of the City of New York, and also in Worcester, Mass. ; was admitted to the bar in 1875 and commenced practice in Boston, Mass., in 1876; moved to Newton, Mass., in 1882; member of the Newton City Council 1883-1887, serving as president in 1885 and 1886; elected as a Republican to the Fifty-seventh and Fifty-eighth Congresses (March 4, 1901-March 3, 1905); declined to be a candidate for renomination in 1904; one of the managers appointed by the House of Representatives in 1905 to conduct the impeachment proceedings against Charles Swayne, judge of the United States District Court for the Northern District of Florida; resumed the practice of law in Boston and resided in Newton, Mass. ; trustee of Dartmouth College 1905-1915; member of the Massachusetts Board of Education in 1915-1919; member of the Massachusetts constitutional convention in 1918 and 1919; served in the State militia for ten years; trustee of the board of public control for the operation of the Boston Elevated Railway 1918-1928, serving as chairman 1923-1928; died in Newton, Mass., on November 30, 1929; interment in Newton Cemetery, Newton Center, Mass.